Gout has been around for millenia and ancient Chinese physicians gave it names like tong feng which means painful wind and bai hu guan jie lu feng which translates as white tiger joint running wind. The incidence of gout has been increasing in the west as well as in China. According to the Health Quality and Safety Commision of NZ, the incidence of gout increased by one percent between the years of 2011 and 2014. The definitive diagnosis of gout is usually determined by the presence uric acid crystals in the joint fluid during the acute phase of the attack. The major cause of this problem according to modern medicine is the same as what ancient physicians concluded many centuries ago. What causes gout according to traditional Chinese medicine? Gout is caused by the over eating of rich, fatty foods as well as over consumption in alcohol. In traditional Chinese medicine we simply say it is due to unregulated eating and drinking. In modern China, gout is also becoming more prevalent because of the increased socio economic status of the middle class indulging in the bad eating habits of the west. Can the Kidneys and Liver be involved in gout? In addition, to the cause being due to irregular and bad diet, other factors also predispose the patient. Chinese medicine has the view that external environmental factors such as wind and damp can lodge into joints causing arthritis and rheumatism. Further more, common patterns of disharmony involving inhibited blood circulation or sometimes called blood stasis in traditional Chinese medicine contribute to the attacks of gout. Traditional theories view that the liver controls the ligaments and tendons and that the kidneys control the bones, and hence the treatment of gout may involve supplementing the liver and kidney energy. Will the acupuncture be painful? 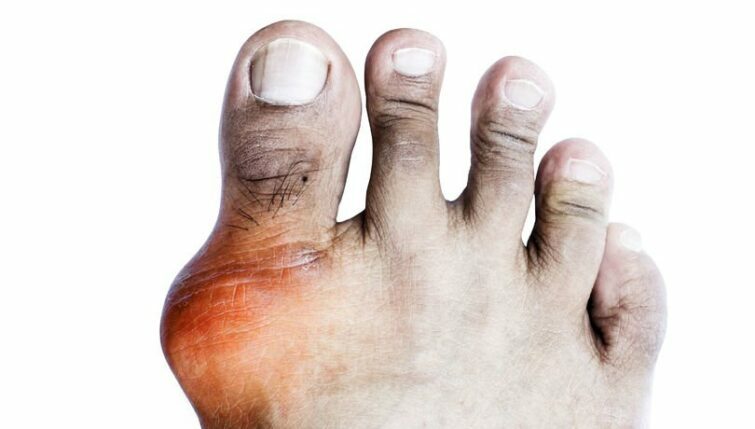 The most common location of gout is at the joint of the big toe and as can be imagined, it is even extremely painful just to touch. It would also be extremely painful if strong stimulation with local acupuncture points was performed at the swollen area. However, this would not be the case, as the main acupuncture points for gout would be away from the actual area of pain, such as below the knee. What about moxibustion, traditional external heat therapy? Another treatment that we would use as part of the acupuncture would be the use of moxibustion. here we would actually use it locally at the site of pain in the form of direct moxibustion which is also called chinetsu in traditional Japanese acupuncture. using locally like this, we are actually aiming to the take the heat and swelling out of the joint as well as promoting blood circulation to the area to enhance the recovery process. Leading a balanced lifestyle with a bland and moderate diet is imperative to aid recurrent attacks of gout. Simple additions like pearl barley soup will benefit as it can urinate out the toxins so to say. Based at The Acupuncture Clinic - Hastings, Mike Yin has a Master's degree in Acupuncture and is working on a PhD in traditional needle techniques. Mike Yin is a full member of Acupuncture NZ and an ACC accredited treatment provider.